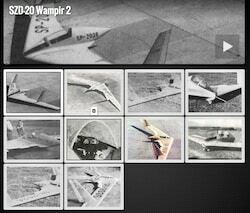 The SZD-20x “WAMPIR-2” bearing designation SP-2036 was built in the Glider Department Dostwiadczalnym in 1959 from the documentation prepared in 1957.The project leader and main constructor was MSc. Jan Dyrek. The glider was first flown at the airport of Katowice on the 9th of September 1959 by the pilot Adam Zientek. Initially 14 short car towed flights were made to assess the controls before the maiden flight was undertaken by aerotow. The glider performed well in the calm air conditions, but in turbulent air was troubled by wing flutter. The airbrakes, on the wing between the elevator and rudder, were found to have a strong influence on the longitudinal balance. On the 11th September 1959 the glider moved to Bielsko in order to continue testing at the factory. This was a prototype of the experimental competitive sailplane designed for investigation of the flying characteristics of tailless types. In order to achieve a good basis of comparison with normal types, a span of 15 m and wing area of 15 m2 were chosen. From the 9th September until 10th October 1959, the glider made 28 flights with a combined time of 9 hours. 47 minutes. The flights were mainly devoted to mastering specific features including determining the proper location of the center of gravity, before deciding on the appropriate test program. On the 6th October 1959, during the flight experiment at Bielsko, the glider was destroyed in the air due to severe flutter. The pilot bailed out safely. 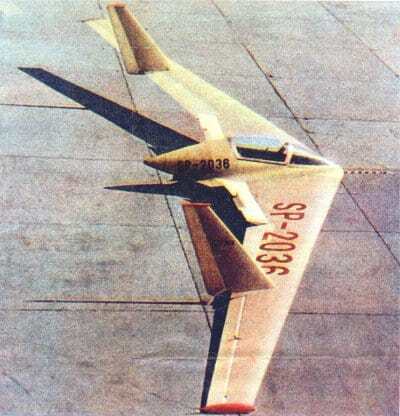 SZD-20x “VAMPIRE-2” was an experimental competitive glider of wooden structure.It was tailless glider with average wing sweepback and dual fins placed on a the right and left wing. The shape of the wing was of the Delta design with extreme trapezoid wing tips. The wing consisted of two halves joined to the short fuselage with 2 attachment points. Auxiliary jacks attached the rear spar fittings with main. The wing was generally covered with plywood, only the middle portion was covered with canvas. For the fuselage canopy the left hand side wing covering was reinforced to facilitate access to the cockpit. The fuselage was an egg-shaped wooden structure constructed internally from welded steel pipes, inside which were all of installation fittings for the wings. The landing gear consisted of the two pneumatic 300 x l25mm wheels placed, one in the centre at the rear and the other at the nose which had two full rubber rims. The nose of the fuselage did not protrude from the wing outline. In the nose was a launching hitch and behind this was fitted a bracket for ballast weights. The nozzle of the Pitot sticks forward of the nose. The cockpit is completely covered with a plastic canopy and was side opening. This was designed to be ejected in flight. The pilots seat had to be adjusted whilst on the ground, but the pedals were not adjustable. The instrument panel included speedometers, altimeters, vertical speed, turn, compass and accelerometer. The tail was in two parts and occupies a central trailing edge of the wing in the area of the fuselage. Tilting the direction and operation of this tail was the reverse in comparison with a conventional tail . For example, pulling back on the stick causes the front to go down and thus increases and conversely reduces the speed of the glider flight. The net effect of the elevator is thus the same as on a conventional glider. Special arrangements in the control mechanisms made it possible to investigate various control arrangements.In addition to coupling with the elevator can be operated the ailerons, placed at the ends of the wings. Turning on or off coupled ailerons was able to be performed continuously with the slider on the stick. This slider could be locked in any position with the help of a knob. 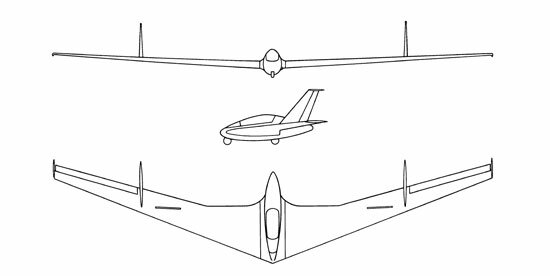 Aileron deflection on and operating coupled with the elevator are the same as for a conventional glider, eg tendon rod causes the aileron deflection upwards and raise the front of the glider. Coordination of ailerons with rudder does not occur at the expense of deflections, but increases the total extreme swing. The air-brakes are withdraw-able aerodynamic discs of sheet metal panels which were arranged behind the spar, at the inner side of the panels toward the tail.